Millennials, despite years of scrutiny, are growing up and becoming quite conscientious of more adult matters. When it comes to the adult task of grocery shopping (as opposed to the convenience store mentality of college years), millennials are forging a new path — one which includes convenience, affordability, and mobility. Grocery retailers will be wise to catch on to these three shopping habits of millennials, as they will patronize only those grocers willing to accommodate their specific needs. In light of the fact that 34% of millennials call their grocery shopping style “thrifty,” it makes sense that, like prior generations, millennials like coupons. Seventy-three percent find coupons in print sources (e.g., newspaper, direct mail), yet the demand for digital coupons is growing. With 92% of millennials owning a smartphone, and the majority using it to help with grocery shopping, retailers have tremendous opportunities to cash in and connect with this generation. Curate a product selection that speaks to their interest in cooking, but isn’t so complicated to prepare that their default “let’s eat out” mentality kicks in. For example, provide freshly prepared, natural foods and snacks. Global cuisines and exotic herbs and spices also appeal to millennials. Create signs that tell stories, display easy, quick-to-make recipes nearby the ingredients, and demonstrate in-store experiences with interesting products. Provide opportunities to sample frozen meals, which they favor more than previous generations. 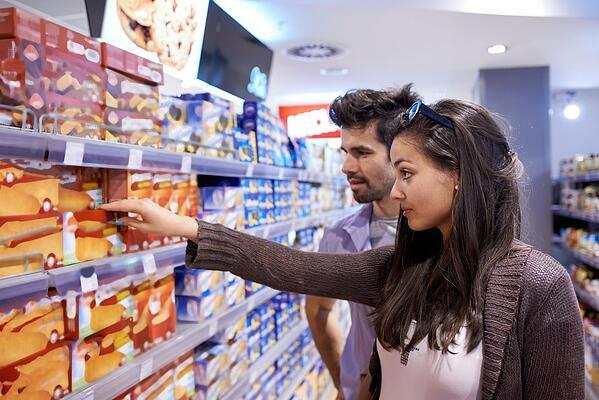 However, do not overlook the higher premium this generation places on fresh, prepared, and convenient foods. While grocery stores have always provided a sense of home and family, the age of bulk shopping has somewhat altered the shopping experience. Millennials, on the other hand, expect convenience, coupons, and community when they set out to shop for the week. Keeping these factors in mind will pay off in the long run for grocery retailers expecting to service this impactful generation.